This is today the main square in Strasbourg, possibly you walk here every day and yet… Do you have the faintest idea where you set foot? On what? Or, should I say, on whom? 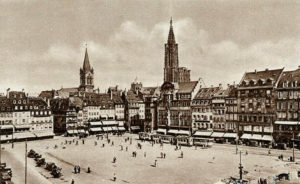 But let us go back in time a little and look at the different faces of the square over the centuries. Being today a stopping-off place, surrounded by shops, the square is also one of the city’s hearts thanks to its dynamism. It often comes to life during political, cultural, commercial or sports events, as with the victory of the Bleus (the “Blues”, nickmane of the French football team) in the World Cup (YEEEEAAAAHHHHHHH! “Bring the Cup back home…”). Today, pools of water delight kids and grown-ups alike when the weather is hot. There is also these large stone slabs on the ground that bring happiness to our heels, our air chambers and other stuff that aren’t too keen on angles, slits, spikes and gaps. It has been a little over ten years already since the square was granted a makeover, in 2007. How was is just before? Well, not a pedestrian-only area, it wasn’t! Until the 90’s, there were still roads and a parking lot. And before that, from 1886 to 1960, the heart of the tram network stood there. By the way, just next (1961) and for the years to come, we started major works to redevelop the square, in particular regarding the underground parking lot. It is this very episode of urban work that shall reveal to us the bowels of the square. But let us proceed by layers. The first one is the parking. Have you ever been down there? You may find that weird, especially if you are an inhabitant of Strasbourg, which pretty much means you are a cyclist (?). Our walking tours of the city might very well lead you there sometime. Why so? To better understand the origin of that square’s name today. As we will see, it was not always called like that, of course. The general Kléber, born in Strasbourg, distinguished himself during the wars of the French Revolution, so much so that it was decided to make of him a hero of the nation. Indeed, in 1800 (which is also the year he died), he won a battle in Egypt (hence the small sphinx laying down behind the legs of Kléber’s statue) facing the Ottomans (allies of the British). To win a battle, what could be more normal for a soldier? Nothing here really to make him the hero of a whole nation… The thing is, there were almost 60 000 turks while the French army only had 13 000 men on site. Well then? Not bad, heh? No reason to rejoice at the deads and a glory useless to all, I agree. But in strict principle, you’ll have to admit that our general from Strasbourg rocks the place. He rocks it so hard that he has got a spot at les Invalides (military necropolis – Paris). This is where it gets interesting. He was so popular that Paris and Strasbourg both wanted very much a grave to Kléber’s glory. So, he wasn’t cut in half, but he was cut nonetheless! Yes, his heart rests in an urn in Paris while the rest, burned to ashes, rests in a… parking lot! We can convene it probably isn’t the ideal place where to find peace and eternal rest, yet I suggest you get there by yourself. Now, if the gloomy mood, poor and pale lighting or even the possibility to find yourself face to face with the general’s ghost scare you the slightest, take the opportunity of a Free tour of ours to get there with one of our lovely guides and other curious people who joined us 😉 And rest assured there is still much to tell about the general, his battles, his tomb… and about the square itself! That’s it, now you know the origin of that square’s name, named thusly during the inauguration of the general’s stele in… 1840!